A Bridge Too Short is a single-player Donkey Kong minigame featured in the game Mario Party 7. The minigame's title is a play on the 1977 movie, A Bridge Too Far. The player walks up to the first pair of bridges, the screen splits to show Donkey Kong, and then the game starts. The player races against Donkey Kong to reach the finish line. The player has to pick one of the two bridges to cross. There are four pairs of bridges that lead to the finish line, each pair having a correct bridge and a hidden broken bridge. If the player crosses a bridge and it suddenly breaks, the player loses some time to get to the other bridge. If the player picks the correct bridge, they proceed to the second pair of bridges and so on until they reach the finish line. The player must do so before Donkey Kong to win. Donkey Kong usually takes a while to choose a bridge. Also, whenever the player makes the exact same bridge choices as Donkey Kong, if Donkey Kong's bridge breaks, so will the player's. 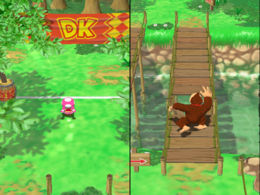 As a result, the player can potentially avoid falling behind if they let Donkey Kong choose a bridge first, but the player still has to be ahead of Donkey Kong to win the minigame. Rules – "Run across the bridges! If one breaks, you'll have to go back and take another path." Advice – "If you pick different bridges than DK, you might get lucky and beat him to the finish." This page was last edited on August 9, 2018, at 16:58.